Fish Oils are trendy in today’s culture. 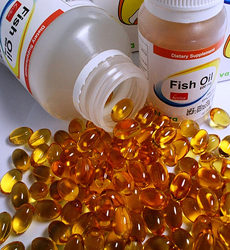 It seems that everyone is recommending fish oil supplements for their much touted health benefits. What do fish oils do? (1) Lower Triglycerides – Lower concentrations of triglycerides (the form that fat is stored in the body) in the blood are known to be one of the benefits of fish oil supplementation. (2) Helps Overcoming Depression – Fish oil supplementation effects serotonin levels and so is recommended to help overcome depression. Don’t depend solely on it however; serotonin levels are an effect not a cause. A chronic way of thinking results in the level of serotonin and a change in mental attitude and outlook is the only way to permanently and naturally overcome depression. (5) Healthy Joints – Omega 3 from fish oils play a role in preventing and treating arthritis. When something goes wrong in the lubricating system between 2 bones, you’re in a world of pain. Supplement with fish oils to help ensure this never happens to you. As a bodybuilder preventing joint pain should be especially relevant. Omega 3’s are really important and people should get them. I was just reading one of my favorite magazines the other day and this is just one study… but it was talking about how Omgea 3’s since they help to fight inflammation, then are not good for muscle growth. It was an interesting point and relevant to your post. I am still skeptical because again it was only one study. I think the magazine was Fitness RX. Another good post Mark. I’ve got to get my stuff squared away again and get back on track, reading your blog helps remind me of what I need to be doing. @ Caveman – Thanks. I hope you get back at it. For one thing, fishes, not just fish oil contain a myriad of vitamins and minerals that other meat products do not have. Firstly, calcium, which in fish meat by far surpass chicken, pig, and cow meat. Secondly, iron since the ocean is rich in algae and is commonly eaten by fish. Thirdly, high-density lipoproteins, which is by far superior since it is reputed to help digest and transport fatty acids to the liver. Hey Mark. Love your site. How much fish oil should I be taking? I see varying comments around web from 1g 3x/day …or even 2g 3x/day. 1g, 3 times per day of fish oil is plenty. Exactly how much Omega 3 should be taken daily? Because to my understanding, different brands of fish oils contain different amounts of Omega 3 (depending on the quality). @Bo. I advise about 1000mg (1g) of actual omega 3 per day. For me, that’s 3 x 1000mg capsules of my omega 3,6 and 9 supplement. same here mark. I was just gonna write about the relevance of omega 6 and 9. Taken on a regular basis they really do make a differance! My daughter is 16, athletic. Our family has a history of strokes. Should I give her this supplement this young?